As I have written before, the one reason I could not completely ‘go veggie’ is the fact that I just could not live without eating seafood (which sometimes causes problems when having people over that are seafood-unfriendly – their loss!). I recall that I had gone almost a year without touching any kind of meat until Renata and I traveled to Fortaleza back in 2007 – my first trip to Brazil in seven years – and was immediately reminded of how much I loved the stuff. Our first culinary stop on that trip was at a restaurant at Dragão do Mar Cultural center, a structure built in the late 90s that includes various eateries, two movie theaters, performance spaces, a planetarium and art galleries. There we ordered their signature dish (named after the center), which is basically fish fillets in a tomato-based sauce with a side of white rice. There we also the famous stewed crabs served every day on the beach. Eating them is a laborious and messy procedure (you have to remove the meat from the legs, claws and head with the help of a wooden stick, and in the end you really need to jump into the water to clean yourself up. In Fortaleza, beachfront restaurants serve it in the evenings – a gamble that was initiated by Chico do Caranguejo in the 80s that paid off so well that today they are not only one of the most popular restaurant of its kind but also the main crab distributor for the area. Among the different kinds of fish that I enjoy cooking here are salted codfish. Though they can be a lot of work to prepare (you have to remove the salt by submerging the cod in fresh water for 24 hours, and the water has to be changed several times), but the result is always very satisfactory. Salted fish has a much stronger flavor than its fresh counterpart, and it is also more versatile to prepare and to pair with wine. 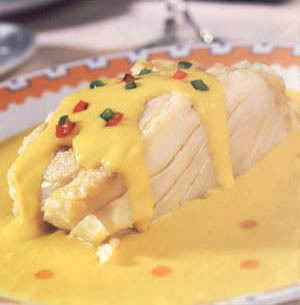 In Brazil, codfish is traditionally served on Good Friday (when beef is traditionally not consumed by Catholics) and also on Christmas Eve, but I like to prepare it all the time using various recipes I have learned over the years. From Receitas de Bacalhau, translated from Portuguese. Sauté vegetables in olive oil until softened. Add the codfish and the dende oil, sauté until cooked. Add coconut milk and simmer gently for ten minutes. Serve with white rice.